Ag-Plus Mechanical Ltd. embodies of very idea of the little engine that could. Starting out 21 years-ago as a one man equipment and maintenance operation based near Medicine Hat, it has since grown into an award winning, multi-line dealer of various new and used farm machines and agricultural implements, with a trading area which extends throughout southern Alberta and Saskatchewan. Carrying Versatile, Bobcat, McCormick and Vermeer lines, among others, Ag-Plus backs every product it sells with a full service guarantee. The company also carries a full range of parts to ensure complete customer satisfaction. 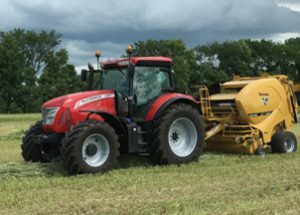 Ag-Plus co-owner Bruce Johnson says he and partner Jeff Gold would not have enjoyed the success they have without thinking about their marketing strategy a little differently than most. To this end, Johnson says being flexible, anticipating customer needs and presenting solutions which maybe the customer himself hasn’t thought of yet is an integral part of the company’s service model. “I tell our team in here we have stopped being equipment providers and we have started being solution managers. Every scenario is different, and when you sit down with a customer across the desk it might be about the equipment. It might be about time management. It might be financial solutions. This new generation of farmers has an acute business sense they are bringing into their everyday operations, says Johnson. They are looking ahead of the curve and at their bottom line from a whole new perspective, and Ag-Plus has to be right there beside them every step of the way. In 2016 Ag-Plus won the Top Vermeer Dealer in Canada award and the Top McCormick Dealer in North America award. 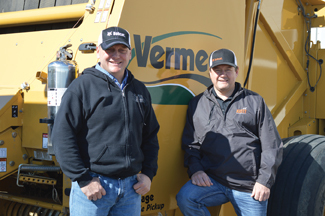 It also placed in the Top 10 of Vermeer Dealers in North America, a Canadian first. Johnson credits his staff and Ag-Plus Mechanical’s dedication to its customers for these awards. “Your strength in relationship building and your quality service will set you above, and that is what will keep the guy coming through the door. They got to want to do business with you,” says Johnson. “We as dealers work super hard to create a one stop opportunity for our customers. We want to be able to offer the customer the product which is the solution he is looking for that day. Photo courtesy Ag-Plus Mechanical Ltd.
Ag-Plus Mechanical based near Medicine Hat is recognized as one of Canada’s top agricultural dealerships, winning awards for its innovative product lines, including McCormick, Vermeer, Versatile and Bobcat, and its high customer satisfaction rating. Ag-Plus Mechanical Ltd. owners Bruce Johnson and Jeff Gold place a premium on customer service and support.